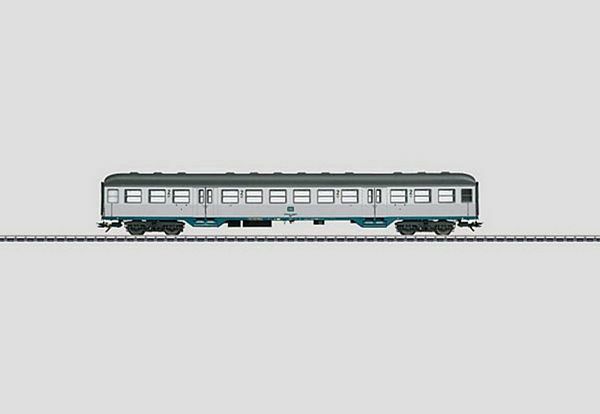 Prototype: German Federal Railroad (DB) type Bnb 719 commuter car, 2nd class. "Silberling" / "Silver Coins" design. Car number 50 80 22-12 339-4. Model: The minimum radius for operation is 360 mm / 14-3/16". The car has an underbody specific to the car type. The trucks have brake shoes. The car has factory-installed LED interior lighting. It also has operating current-conducting couplers. The 73409 marker lights and 73406 pickup shoe can be installed on the car. Length over the buffers 28.2 cm / 11-1/8". DC wheel set 4 x 700580.